After a false start, the Apple invites are officially out. The new iPhone 5S and iPhone 5C are going to be announced Sept. 10th, as expected. And at least one of them is going to be the rainbow bounty we'd been hoping for. As is often the case, Apple has infused its invite with a not so subtle clue about what we can expect. 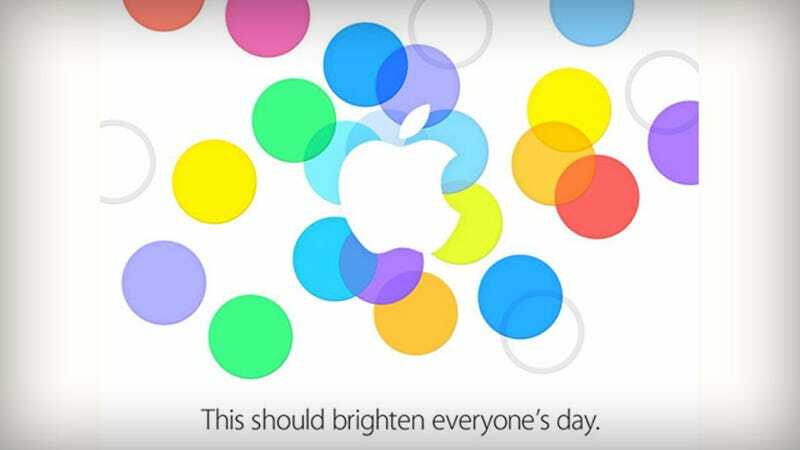 The colorful dots are likely the palette that the iPhone 5C will come in, and they should "brighten everyone's day" because they are, er, colorful. Or it's a reference to the glittering gold champagne iPhone 5S that's coming down the pike. Or there's some sort of iFlashlight that's going to revolutionize the... flashlight... industry? The event will be held at Apple's Cupertino headquarters instead of its usual Yerba Buena Center fête; that's not entirely out of the blue, though, as Apple last played a home game for the similarly iterative iPhone 4S. You can expect preorders to come soon after, with shipments arriving on Sept 20th.